Hey, who's toothbrush is this? Can you imagine the scene in the bathroom at sleep away camp? Combs, brushes, tooth paste and brush, shampoo, and a toiletry kit full of everything you could think of to pack-left on the sink in the shower stall, or the towel hanging on a hook. Label it! That's my motto for personal items from water bottles, backpacks, shoes, electronic stuff and everything in between. Mabel's Labels are truly one of my favorite brands I've come to value since I started this blog. Each member of my family has a set, I order sets from time to time for new little ones in our extended family, and at Christmas time for stocking stuffers. The past few days have been cold and rainy, but Summer plans are being made! Mabel's Labels has new set for Day Camp and Sleepaway Camp. I tend to over pack for camping, or really for any trip, for that just in case moment. 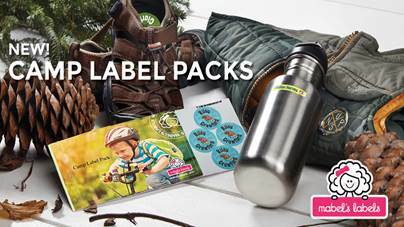 Mabel's Labels are perfect for any age to keep personal items safe and snug in their day pack or sleepaway duffel bag. 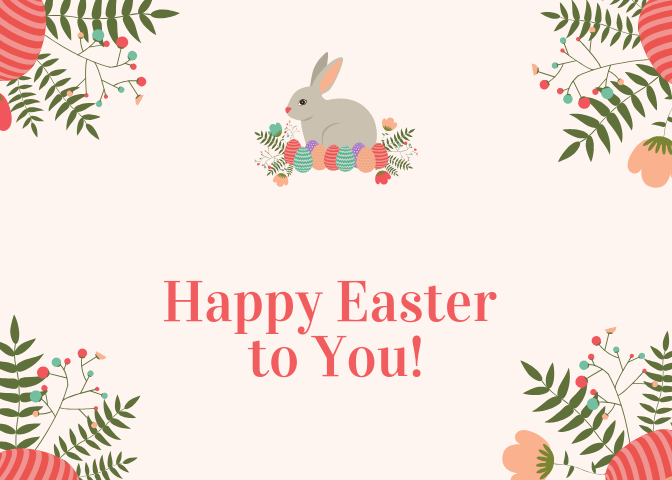 Hop on over to see the entire Camp label collection and a wonderful Camp Resource Guide from brand Co-Founder and Camp Expert Julie Cole. The icons for camp are super cute and colorful! Our Summer Camp has chipmunks when it's quiet there so I chose the chipmunk for our set. We don't see the little creatures much but they are cute as long as they stay out of the cabin! When the set arrives, I'll be busy labeling everything that goes to camp. The camp sets area available for a limited time-through July 31, 2016 so order early and put a label on everything on the camp list. 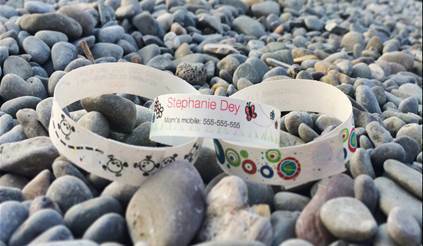 Designed to keep kids safe on summer outings, these durable, disposable kids ID bracelets are perfect for the beach, the pool, theme parks, playgrounds, and other destinations. Personalize them with vital information and contact details to help lessen the panic of being separated in a crowd. For added privacy, custom ID bracelets may be attached around belt loops or under socks. $21 for 30 bracelets. Mabel’s Labels donates a portion of all sales of this product to Autism Speaks, an organization that promotes research and awareness about autism. Disclosure: I received information and a Sleepaway Camp Label set from Mabel's Labels for the purpose of this post. The comments and views are my own.